When changing your body shape and weight, either by building muscle or losing fat, calories are everything. The number of calories you eat will determine whether you lose or gain weight. 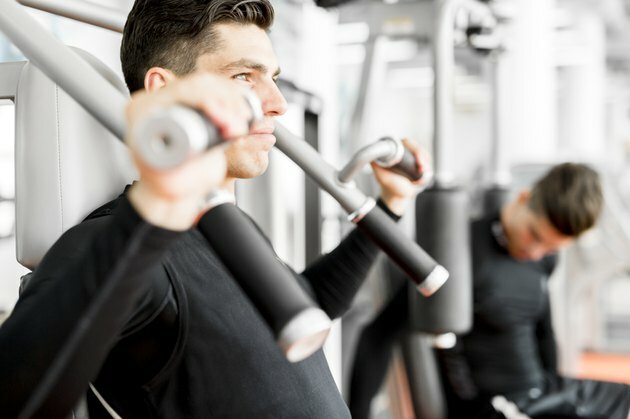 The trouble is, building muscle and losing fat simultaneously is extremely difficult and can only be done on a small scale, notes strength coach and nutritionist Marc Perry. Therefore, you're better off either eating the right number of calories to lose fat while maintaining muscle or building muscle while keeping fat gains to a minimum. The first step in determining how many calories you need is to calculate your maintenance level. This is the number that you need, based on your current daily activity level, to keep your weight the same. According to the Harvard Medical School, this equals around 15 calories per pound for the average moderately active adult -- approximately 2,100 calories for a 140-pound person or 3,000 for a 200-pound person. If you're sedentary, you'll need less than this, and a very active person will need more. To lose fat, you need to consume fewer calories than you burn, which means eating less than your maintenance level. To see 1 pound of fat loss, you need a deficit of 3,500 calories. By reducing your maintenance intake by 500 per day, you'll lose 1 pound each week; by reducing it by 1,000 each day, you'll lose 2 pounds per week. Building muscle requires a surplus of calories, meaning you need to eat above your maintenance level. This gives your body the energy needed to build and repair muscle cells. During a muscle-building phase, you could just add 500 calories to your maintenance level or get a little more aggressive. Dietitian Christine Rosenbloom recommends multiplying your body weight in pounds by 23.6 to 27.3 to find how many calories you need for bulking up. This should result in muscle gains but may also lead to unwanted fat gain, so a more conservative approach may be better. To avoid fat gain when bulking up, keep a close eye on your progress -- if you're consistently gaining more than 2 to 3 pounds per month or visually gaining fat, reduce your calorie intake slightly. Additionally, focus on nutritious, whole food sources, versus high-calorie junk food, to avoid gaining fat instead of muscle. For most people, losing fat and gaining muscle simultaneously is so tricky and happens so slowly that sticking to just one goal is a better option. For certain groups of people, however, doing both at the same time is a little easier. Two of these groups are those who are new to training or people returning after a long layoff, notes personal trainer Christian Finn. If you fit one of these parameters, consider starting out by eating your maintenance calorie intake and adjust depending on how you progress. Built Lean: Can You Lose Fat and Build Muscle at the Same Time? Why Am I Losing Weight But Not Body Fat?